The need and how to shift patterns around the production and consumption of consumer goods is not well understood. The issue remains a low priority and setting goals and integrating efforts can be a challenge. Pilot projects can address this by illustrating benefits and generating metrics. Calculating emissions related to production and consumption can also help shape goals as cities look for ways to reduce emissions from intensive areas such as the production of meat or of building materials and contents. Connecting sustainable consumption to issues that are gaining momentum can be effective. For example, some cities are expanding from food waste collection to recovery and rescue, food waste elimination via behavior change campaigns, and meat alternative programs. Concerns about disruptions in recycling markets can provide an opening to discuss upstream strategies. In cities where public-facing programs have been launched, communicating about the need to reduce consumption can leave out those who struggle to meet needs. 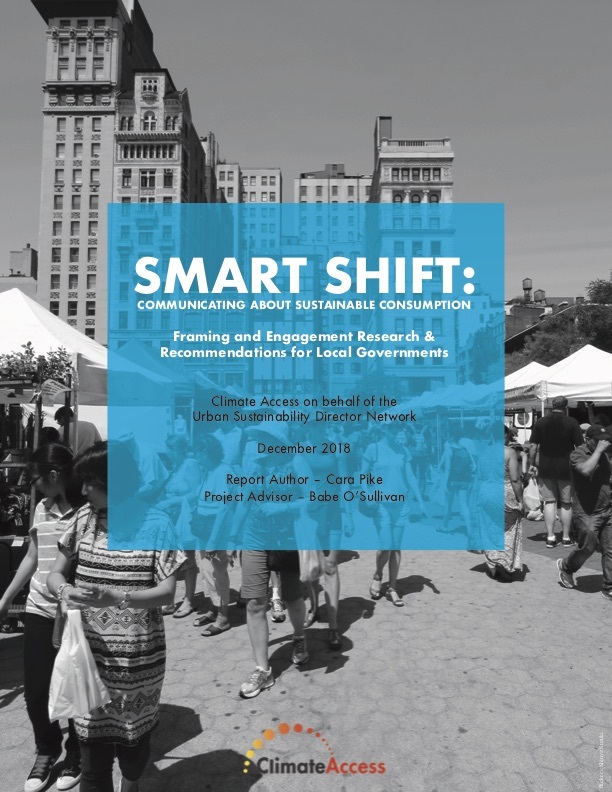 Ultimately, for city staff and the public, sustainable consumption requires reimagining the economy and going against the hard-wiring of consumer culture, which are not easy to do. Framing sustainable consumption primarily as an environmental issue can have limited appeal given most Americans care about the environment and climate change but prioritize other concerns (e.g. economic). The issues are often complex and can generate a sense of guilt and/or fatalism that hinders action, and the majority of the public view living in ways that helps the environment as being costly and time-consuming. There are positive trends that can be leveraged to build support for addressing consumption. Some Americans are looking to contribute in meaningful ways, there is growing support for sharing products and services as well as having access to durable goods rather than items with short life cycles. Perhaps most importantly, for the majority of the public, wealth does not define the American dream. Instead, freedom of choice of how to live and having a good family life are the most important attributes. Align consumption with core city priorities (i.e. reducing waste management costs, cutting emissions, increasing access to services and social capital). Work with other departments to set and implement goals. Look for opportunities at the intersection of structural and behavior change. Create pilot projects to illustrate what is possible. Develop and communicate the business case (financial and other benefits). Tap outside experts for expertise and support amplifying the case. Share stories and celebrate reduction and reuse innovation within city government. Lead with the opportunity to contribute to a strong and connected community through consumption programs. Emphasize multiple benefits including financial savings (avoided waste management costs), cutting pollution and carbon at the source, increased access to services through sharing, repairing and reuse, more resilient local supply chains, and the generation of social capital. Clarify the challenge by conveying that the costs of consumption are adding up. Resource use, water and air pollution and carbon emissions are often most significant at the production and consumption stages, there are limits to recycling, and product obsolesce impacts city and household budgets. Outline the choice by showing how the city can move forward with programs that deliver multiple benefits such as sharing, reuse and repair; promoting smaller homes and walkable, transit-friendly neighborhoods; and meatless meal initiatives. Place equity at the center. Involve community members in shaping consumption initiatives so that programs reflect concerns and deliver tangible benefits. Consider environmental outcomes but also how sharing, reuse, and repair programs can help save money, create jobs, improve access to services and strengthen the community. Tailor to the approach based on what different segments of the community care about and bridge to shifting consumption. For example, in cities where people are connecting around community garden and cooking programs, introduce meatless meal alternatives. Start small, such as with one tool lending library, illustrate the benefits and build on the momentum. Make programs accessible and fun to participate in. Focus on the opportunity to save money, access services and make a big difference by shifting our consumption. Take steps to ensure the approach is inclusive by avoiding the phrase “reducing consumption” or highlighting benefits such as eliminating clutter. Incorporate the challenge but make it clear and relevant. Tap into frustrations around pressures to keep up with trends and wasting money on products that don’t last. Point out that consumption creates impacts that we don’t want—pollution, waste, and carbon emissions. Convey that making a smart shift away from having to buy new stuff or anything at all is something everyone can do. Provides examples of the different choices that can be made such as sharing, reuse, and repair; selecting alternatives to meat; giving gifts of experiences; or living in smaller homes. On behalf of USDN, Climate Access developed framing and engagement approaches to generate advance sustainable consumption programs within municipal government and with the public. Recommendations in the Smart Shift report were informed by a working group with members from Austin, TX, Eugene, OR, Iowa City, IA, Minneapolis, MN, Portland, OR, San Antonio, TX, San Francisco, CA, San Jose, CA, Toronto, ON and Vancouver, BC; a review of public opinion, marketing, and social science research; and interviews with seventeen staff from working group cities representing a range of departments and programs.